In Memory of Hard Work! Above is the cover of our mini book. We've used our Mix and Match Transparent Die Cuts along with the Mix and Match Chipboard set (same die lines to be used for super fun mini books and projects). The cover is using a transparent portion of the set and our Daily Grind shapes and alpha chipboard. I painted the transparent part to hight light title. 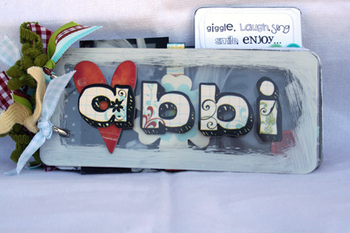 The heart and letter 'a' are on top, the 'bbi' are just beneath it on another transparent sheet! You can see as we go that the transparent pages can be seen through... this page is also transparent (making the first 3 pages clear). 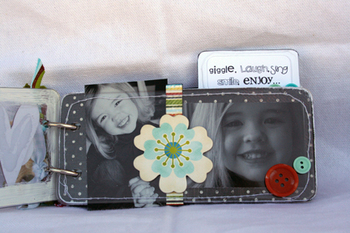 This page includes some button embellishments from our Daily Grind buttons, a strip of paper also from the Daily Grind set and a printed chipboard flower from the Daily Grind shapes set! I also used my sewing machine to stich around this edge. 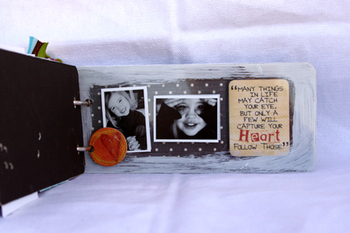 It looks cool since I couldn't sew on to the chipboard and decided not to stitch on my photos, but it looks like it. That is one reason why I LOVE our transparent die cuts. They aren't thick like acrylic, yet they have a similar look but can be stitched through! 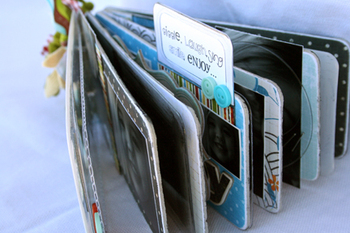 Next, after our chipboard sheet (seen through the above sheet) is another transparent sheet! This one is fun, once again, becasue the picture seen here is actually on the chipboard page...I painted a frame to fit the image, without painting on the picture itself! 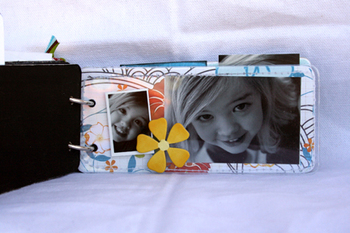 The chipboard flower, from the Daily Grind Shape set, with button center, is glued to the transparent sheet...beneath this sheet is the journaling block and photo! Okay...I like this one, too :)! 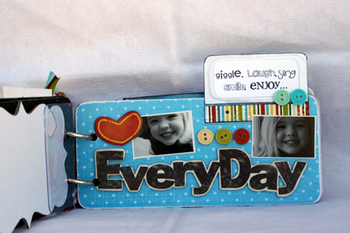 I used one of the large printed chipboard shapes from the Daily Grind set to do my journaling block. 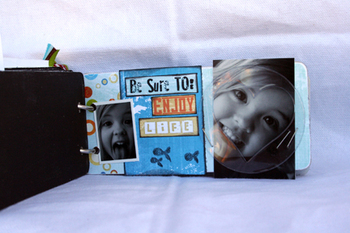 I attached it to the book with a transparent die cut tab...you can't even see it! 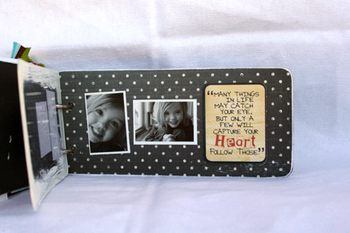 I added journaling, a mini image and printed chipboard star! Another 'see through' page. I stitched around the outer edge, added this cute yellow chipboard flower...added photos on the chipboard page behind it, and, voila, another fun page! 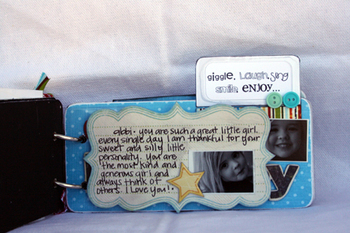 Okay...here I used Daily Grind papers, tags (die cut word strips), Daily Grind Mini Stamp set (fish stamps) and a transparent die cut shape. It is a circle with a heart cut center (I stapled it to the photo---it's kind of hard to see, but accents her little face with the heart! 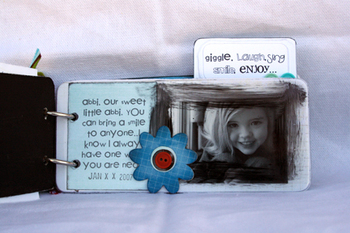 Below are the last two pages...this first one has a chipboard shape (circle with heart) lined with a white painted edge and two photos...you'll see when you turn to the final page that there are photos lined up behind these ...this is fun as you'll get to add more photos to one little book! So, there you have it. My extremly long post about one of my favorite projects that I no longer have! I at least felt VERY fortunate that I had taken photographs of it!! I plan to recreate it when there is time...at least for my little Abbi's sake...she loved it, too! And....if you've managed to read through my long post, please comment here--we'll do a random drawing for some Fancy Pants Schtuff (10 prizes to be exact) to anyone who comments by Friday, Sept. 26th at midnight EST! wasn't receiving our emails! Finally, she got it! So, we are pleased to tell you that we are now finalized and will get things rolling! And, we'll also be sending out a few emails for our runners-up spots! Again...everyone was amazing...we are thankful for every entry.